The dark nights and frosty weather have inevitably taken hold, but fear not – a much-needed winter warmer has arrived, in the form of stunning light show Edinburgh Lumen. Bid farewell to the miserable walk home in the pitch black. This breath-taking display, which has already made national headlines, will transform St Andrew Square, Assembly Rooms Lane and The Mound Precinct with a visual and sound masterclass. Running until 11 March, the event is designed to show a different side to a city that is so highly-regarded for its iconic summer and Christmas festivals. 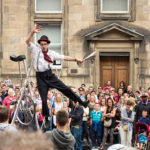 Organisers are urging passers-by to take in the “more peaceful and reflective mood” in these winter months, before big-hitters like the Fringe return later in the year. Offering up a calm aura, the three eye-catching installations – Serenity Garden, Moments Lane and Oceans of Light – are lighting up the heart of the city every evening between 5pm and 10.30pm. Serenity Garden promises to turn the green space of St Andrew Square into a peaceful retreat, with lights dotted around every feature of the garden, and calming music adding the finishing touch. Moments Lane, down the west lane of Assembly Rooms, is made up of three animated scenes projected onto the walls. A countryside scene, coral reef paradise and clear dark night taking in the Northern Lights will stop people in their tracks. Ocean of Light, meanwhile, brings a big immersive walkthrough light feature to the Mound, boasting 12,000 individual suspended lights. Visitors can make their way through and interact with the installation, which was designed by award-winning Squidsoup. 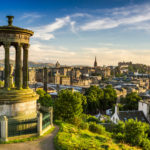 Edinburgh Lumen, created by NL Productions for the City of Edinburgh Council, is free of charge.